« New Weird Al Video Drops August 4th! 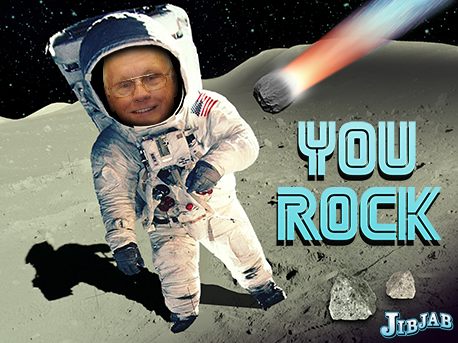 JibJab has had warm fuzzy feelings for NASA ever since they called us for a copy of “This Land” to send to the International Space Station. In honor of the 40th anniversary of the moon landing, we’re busting out all of our most moon-centric and spectacularly spacey Sendables. Did someone give you a lift in their shuttle? Give a space aged “thanks for the lift” card! 40 years is a milestone anniversary. And on big anniversaries, we like some alone time to get intimate. Tell that future astronaut-to-be to keep reaching for the stars! And of course, don’t forget to cast someone in their own moon-landing photograph! Here’s Neil Armstrong, all suited up. Now if you’ll excuse us, we’re going to have to start prepping Mars landing eCards for 2050. This entry was written by paulhanges and posted on July 20, 2009 at 5:09 pm and filed under Uncategorized. Bookmark the permalink. Follow any comments here with the RSS feed for this post. Trackbacks are closed, but you can post a comment.